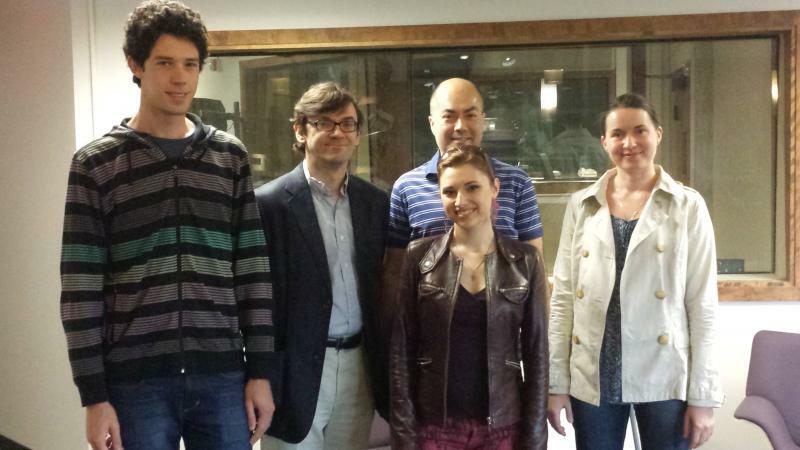 Congratulations to Margaryta Golovko, winner of the inaugural Midwest International Piano Competition! After competing this past week with nineteen other pianists in the senior division from eleven different countries, Margaryta is the winner of a $10,000 cash prize, a CD recording with the Blue Griffin label, a concerto performance with the wcfsymphony on November 1, 2014, and an optional 2-year professional management contract with Heartland Concert Artists. 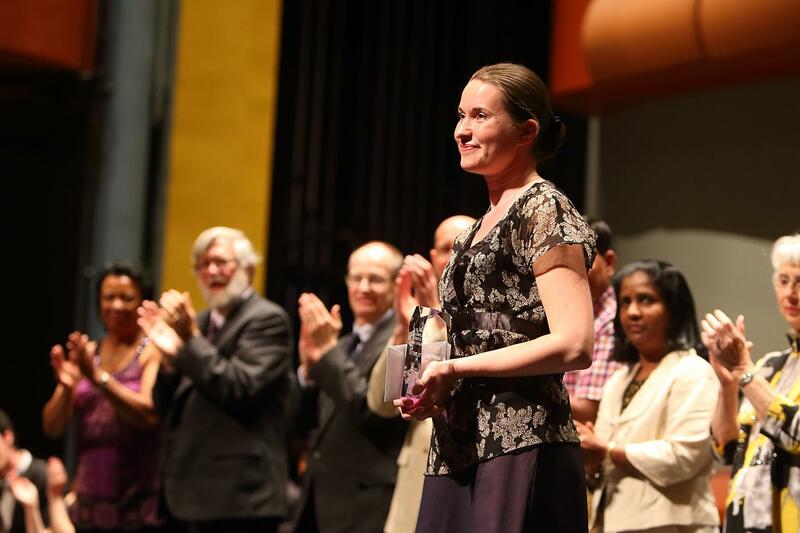 First place winner Margaryta Golovko smiles to the audience after accepting her award in the inaugural Midwest International Piano Competition. Margaryta performed Haydn’s Sonata in F Major, Hob. XVI:29, Rachmaninoff’s Variations on a Theme of Chopin, Op. 22, and Debussy’s Clair de Lune from Suite Bergamasque for the final performance. Second place and $5000 winner was Elina Akselrud, 24, from Ukraine. Third place and winner of $2500 was Tomer Gewirtzman, 24, from Israel. First place in the Junior Division was a tie between Mayuki Miyashita of Japan and Michael Lu of the United States, both winning $2500. Second place and winner of $1500 was William Yang of the United States. Third place went to Yinuo Wang of China, receiving $1000. Margaryta, 27, was born in Kamenets-Podolsk (Ukraine) and started her piano studies in 1997 at the Kiev Special Music School, named after M.V. Lysenko, with Prof. Boris Fedorov. She continued her studies with him from 2004 – 2009 at the National Music Academy of Ukraine P. I. Tchaikovsky (NMAU), receiving a master diploma. From 2009 until 2012 she was an assistant trainee at the NMAU of Prof. Boris Fedorov. Currently she is studying at the International Piano Academy ‘Incontri col Maestri’ in Imola (Italy) with Prof. Piero Rattalino. In 2006 Margaryta participated in the International Piano Commpetition ‘Citta di Marsala’ in Marsala (Italy) winning 3rd Prize. At the 30th International Smetana Piano Competition in Pilsen (Czech Republic) in 2012 she was awarded 1st Prize and the EMCY Prize. Also in 2012 Margaryta received the 3rd prize and the Bacau Orchestra prize at the 1st International Piano Competition ‘Citta di Acquaviva delle Fonti’ (Italy). She has performed as a soloist, as part of ensembles and as a collaborative pianist in concert halls in Ukraine and abroad in France, Germany, Italy and Russia. Margaryta has performed concerts with the Kyiv State Symphony Orchestra, the Bacau Philharmonic Orchestra and Youth Symphony Orchestra ‘Helycon Symphony Orchestra’. In 2013 Margaryta took part in the International Music Festival «MITO Settembre Musica» in Italy (Milan, Torin) where she performed Variations on a Theme of Chopin, Op. 22 by Rachmainoff. In March 2014 Margaryta performed a recital at Mozart Hall in Filarmonic Academy of Bologna. While sixteen of the greatest young senior division pianists from around the world begin to pack their bags, Elina Akselrud, Tomer Gewirtzman, and Margaryta Golovko are preparing for the final round of the senior division of the Midwest International Piano Competition, and the chance to win $10,000. Iowa Public Radio speaks with Midwest International Piano Competition founders Dmitri Vorobiev and Sean Botkin. Hear the two University of Northern Iowa Piano Professors describe the origins of this inaugural event as they give us a peek behind the scenes.